Last season's first, long-awaited crab coming in at the Eureka waterfront. If you haven't got your own pots to drop or if picking and dipping crab is as much work as you want to do, you're likely counting the days until commercial Dungeness crab fishing begins. The California Department of Fish and Wildlife has given the green light to fishing north of the Humboldt Bay jetty starting Dec. 1 to the Oregon state line. Commercial boats will have to wait to fish south to Point Reyes until we get the all-clear on levels of domoic acid, a toxin that can cause nausea, dizziness and even death. Recreational crabbing has been on in our county since Nov. 5. On Dec. 1, commercial Dungeness crab season will open as scheduled from the north jetty at the Humboldt Bay entrance (40° 46.15' N. lat.) north to the Oregon/California state line (District 6). The opener will be preceded by a 64 hour pre-soak period commencing at 8 a.m. on Nov. 28. The area between the north jetty at the Humboldt Bay entrance south to Point Reyes (38° 00' N. lat.) in Marin County will remain closed until the CDFW Director receives a recommendation from the state health agencies that levels of domoic acid - a naturally occurring toxin - do not pose a public health risk. 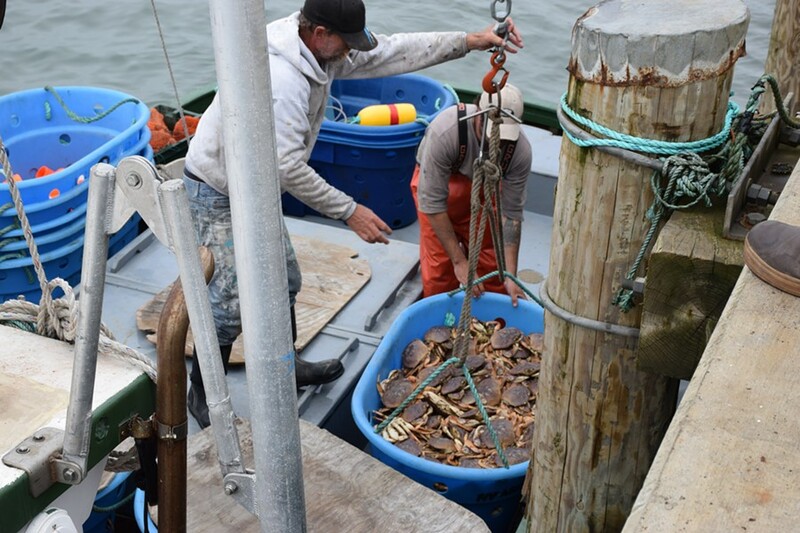 Last fall and winter, domoic acid along the West Coast interrupted Dungeness and rock crab fisheries from Santa Barbara to the Oregon state line. At the recommendation of the state Office of Environmental Health Hazard Assessment (OEHHA), CDFW Director Charlton H. Bonham submitted to the Office of Administrative Law an emergency rulemaking to keep the commercial Dungeness crab fishery closed north of Point Reyes (38° 00' N. lat.) and to close the commercial rock crab fishery north of Pigeon Point (37° 11' N. lat.). State and federal laws prohibit the commercial distribution of seafood products that contain domoic acid levels above the federal action level of 30 parts per million in the viscera. Because of this, on Nov. 8, OEHHA in consultation with the California Department of Public Health (CDPH) recommended to CDFW to close or delay the start of the commercial Dungeness crab season north of Point Reyes and close the commercial rock crab fishery north of Pigeon Point.